Welcome to HauntedIllinois.com's directory of real haunted places. On this page you will find details about Illinois haunted houses, mansions, hotels, theaters, penitentiaries, prisons, sanitariums, hospitals, asylums, graveyards, and other places where supernatural and paranormal activity has been reported. 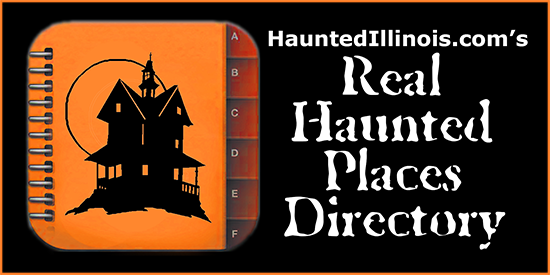 For more information about real haunted places in Illinois, visit our directories of Illinois Ghost Tours and Illinois Paranormal Groups. If you are looking for seasonal haunted attractions of the commercial variety, visit our Halloween Event Directory. Know of a real haunted place in Illinois that isn't in this list? Click here to send us more information. Located along a bluff in Hardin County is a cave connected to a dastardly deed, known by many as Anna Bixby's Cave. At this site, there have been reports of strange glowing lights, some that even move in and out of the trees. Some believe that it may be the ghost of Anna Bixby still watching over the treasure that she hid so many years ago. Location not open to the public. HauntedIllinois.com does not condone trespassing. Visiting locations on this page outside of normal business hours and/or locations that are listed as "not open to the public", may pose a personal safety risk and your actions may result in arrest and/or prosecution. The land where Ashmore Estates stands was originally home of the Coles County Poor Farm. Dozens of inmates died there and the property was eventually condemned in the early 1900s, due to vermin infestations and various health & safety concerns. Some of those who passed on still rest in a nearby pauper cemetery, which still exists to this day. In 1959, Ashmore Estates, Inc purchased the property and opened a psychiatric hospital under their company name. Over the years, there have been many reports of unexplained paranormal activity on the property. Ashmore Estates has been featured on the television programs Ghost Hunters and Ghost Adventures. Location open to the public. Available for paranormal investigations and historical tours. Please contact owners for times and rates. The stories of restless ghosts at the Avon go back many years, even to the early days of the theater. There have long been stories of not only spectral presences but of ghostly ushers and strange sensations of being touched, cold spots and more. Many believe that the ghosts who haunt the place may not be directly connected to the theater itself. In earlier chapters, we explored some of the history of the other buildings on the block and also the sites (like the Race Mansion) that were here before the theater and which were allegedly haunted. The Bartonville State Hospital, which is also known as the Bartonville Insane Asylum, operated in the Peoria area from 1902 to 1973. During its many years of operation, many strange occurrences have been reported on the hospital grounds. After it closed down, the building became the site of frequent excursions by vandals, trespassers and curiosity-seekers, many of whom have had their own encounters in the place. Location open to the public. The remains of the most sophisticated prehistoric native civilization north of Mexico are preserved at Cahokia Mounds State Historic Site. Within the 2,200-acre tract, located a few miles west of Collinsville, Illinois, lie the archaeological remnants of the central section of the ancient settlement that is today known as Cahokia. Location open to the public. Historic tours available. Call or email for more information. The rivers and waterways of southern Illinois have always played a dominant role in its history and folklore. In years gone by, travelers passing on the river often claimed to hear the keening moans of the dead echoing out from the mouth of the cave. These same cries are still sometimes reported today. Do these eerie voices belong to the crime victims of long ago, who were lured to their death at Cave-in-Rock? A tree grows directly from the grave of a "witch" buried in Chesterville Cemetery. Many local residents believe that if the tree is cut down or destroyed, the ghost of the witch will leave her grave and seek revenge on those who caused her death. Over the years, there have been many reports of sightings of the Chesterville Witch. The small town of Grand Tower slumbers peacefully along the muddy banks of the Mississippi River. Once a booming ironworks town, there is little remaining of the city that was in these modern times. Regardless, Grand Tower has been a southern Illinois landmark for years, thanks to the vast array of tales that have been told about the area, including one of the most famous ghost stories in the region. Located in Elgin's industrial section stands the abandoned home of Elgin Casket Company. This once proud building has been witness to murder, grisly discoveries, cult activities, and unexplained occurrences, and a dark legacy has emerged from its sordid history. Visitors still regularly report encounters with some of the former residents that now roam the decayed hallways and abandoned factory floors. Location open to the public. Contact the owners via email at info@eihaunt.com for information about ghost tour dates and times. The Dana House, which was designed by the architect Frank Lloyd Wright, is located in the heart of Springfield's historical district. It was built for one of Springfield's leading citizens, Mrs. Susan Lawrence Dana, and while the "official" word on the place states that it is not haunted, strange things have occurred here. In addition, the house provides the city of Springfield with a link to the history of the supernatural and a connection to those who communicated with the dead. Greenwood Cemetery in the south end of Decatur, is possibly one of the most haunted sites in the Midwest. It was incorporated in 1857, but on one really knows when it was started but burials took place there as far back as the 1820's. Visitors have reported ghost lights, as well as an eerie feeling, while on the cemetery grounds. Hickory Hill - "The Old Slave House"
High on a windswept rise in southern Illinois is one of the state's most haunted spots. It is called Hickory Hill and over the years, it has been many things from plantation house to tourist attraction to chamber of horrors for the men and women once brought here in chains. Thanks to this dark blight on its history, Hickory Hill has long been known by its more familiar name, the 'Old Slave House.' For decades, travelers have come from all over Illinois and beyond to see this mysterious and forbidding place. The secrets of slavery that were hidden here were given up many years ago, but there are other dark whispers about the place. Holy Sepulcher Cemetery in Alsip, Illinois is the burial place of Mary Alice Quinn, a child who died at the age of 14 in 1935. During her short life, some believed that she had the power to heal the sick. People who visit her grave site say they can smell the strong odor of roses, even when none are around. Knox College in Galesburg, Illinois, birthplace of the famed Illinois author Carl Sandburg, was founded in 1837 as a manual arts college on the untamed Illinois prairie. With a history that dates back so many years, the college is bound to have its share of macabre stories that include haunted dorm rooms, sorority house and apartments, but a few stories stand out above the rest! Lewis and Clark Community College in Godfrey, IL, was formerly known as the Monticello Seminary. Harriet Newell Haskell was appointed principal and held the position for more than 40 years. Still today, there have been reports of apparitions, as well has other strange occurrences at the college. Many believe they are caused by the spirit of Harriet Haskell. The Lincoln Theater, located on North Main Street in downtown Decatur, is one of only two of the city's grand theaters that remain standing today. It opened in 1916 with a large seating capacity and a sprawling stage. It was a labyrinth, and remains so today, with its mezzanine, high balcony, basements and sub-cellars. The theater holds many secrets, and according to some, many ghosts. Old Union Cemetery is located in a remote section of Central Illinois. The graveyard saw its first burials in 1831 and it closed down less than 100 years later in 1931 after a fire destroyed the Union Christian Church that was located at the edge of the grounds. As time passed, the road past the cemetery, which had once been a busy stage line between Bloomington and Springfield, Illinois, was abandoned and the graveyard was largely forgotten. Just off the Illinois highways, and tucked away in the shadows of the cornfields of the downstate region, is the small town of Okawville. During its heyday, a number of cheap hotels and health resorts existed here, offering healing baths to those who suffered from rheumatism, digestive ailments and all matter of illnesses, but today only one still remains. It is a place of both history and mystery that still draws people from the surrounding area and beyond. They continue to come here hoping to experience not only the rejuvenating waters of the old spring but the strange and powerful aura of the place itself. Pollak Hospital was added to the Bartonville State Hospital complex in 1949. It was built to treat patients with tuberculosis. Three to five people died per week, bringing the death toll to the thousands. It is reportedly haunted and many paranormal groups have conducted investigations there. Location open to the public. Both paranormal and historic tours are available. Please call for times and dates. The Ravens Grin Inn is a 1870 inn with a haunted reputation where people sometimes have supernatural experiences. A tour of the house can take from one to one and a half hours as you walk, climb through seven physical levels of unpredictable bizzareness and unique stimulation from the UFO that crashed on the cupola's roof to the hand-dug tunnels running throughout the back yard this will be a very memorable experience. As seen on TV : Wild Chicago HG tv's "Extreme Homes" Comedy Central's "Travel Sick" As seen in print: National Geographic World Mag. Haunted Attraction Mag. Hauntworld Mag. Chicago Tribune Chicago Reader and in the book, "Odd-ball Illinois". Location open to the public. Limited hours, so please call to check when the cemetery is open. While the city of Springfield can no longer boast any grand old movie houses or vintage vaudeville halls, there is at least one theater here that is home to a ghost. This pleasant and unassuming building, which is home to the Springfield Theatre Guild, is easy to miss as you drive past its plain, front facade. However, should you ever go inside, it's not likely that you will forget your visit. Why, you might ask? There is a very good chance this is the most haunted building in Springfield! Near the tiny town of Bull Valley, Illinois is perhaps one of the strangest houses in northern Illinois. It was originally located far off the beaten path and remains secluded today along a quiet and mostly deserted country highway. George and Sylvia Stickney built this English country house in the middle 1800's. They chose such an isolated place for the peace and quiet and for their spiritualistic activities. Both of them were said to be accomplished mediums and they wanted to host parties and seances for their friends. Willow Creek is a small working farm nestled in the rolling hills of rural northwestern Illinois just 45 miles southeast from historic, haunted Galena. Considered by paranormal investigators and others to be one of the most haunted private residences in the state, the farm is also much more - a place for spiritual awakening and enlightenment! Location open to the public. Visits are on a select, first come first reserved basis by invitation only and are restricted to six (6) people or fewer. Please remember that the farm is a private residence and not a commercial, haunted attraction. The Owner reserves the right to decline any and all requests for a visit.